A newly released Lawrence Berkeley National Laboratory (LBNL) report has found that when the share of electricity generated from wind and solar reaches 40-50 percent, wholesale power prices will decrease by US $5-$16/MWh. The LBNL study also has implications for demand and supply-side investment decisions, electric vehicle infrastructure planning, and the design of energy efficiency and demand-side management response programs. The report by scientists in the laboratory’s Electricity Markets and Policy Group reflects the first year’s qualitative findings of an ongoing three-year effort funded by the Strategic Priorities Impact Analysis section of the Department of Energy’s Energy Efficiency and Renewable Energy Office. “These high renewable futures might have pretty widespread implications for a lot of decisions, technologies, and policies that DOE is actively involved with,” said LBL Research Scientist Andrew Mills. The study, Impacts of High Variable Renewable Energy Futures on Wholesale Electricity Prices, and on Electric-Sector Decision Making, found that increasing the share of wind and solar on the grid will also increase price volatility and alter the time of day when prices are cheap or dear. Higher wind and solar penetration can cause price variations to increase, in some cases up to six-fold. Researchers Joachim Seel, Andrew Mills, and Ryan Wiser determined that the amount of variable renewables on the grid increased the frequency of periods when wholesale power prices were below $5/MWh, or in effect, near zero. The variable renewable penetration rate affected the shape of the residual load curve — the portion of load not met by a combination of wind and solar. “Wind and solar have different economic characteristics than traditional coal and natural gas plants,” said Dr. Seel, a Scientific Engineering Associate at the laboratory. 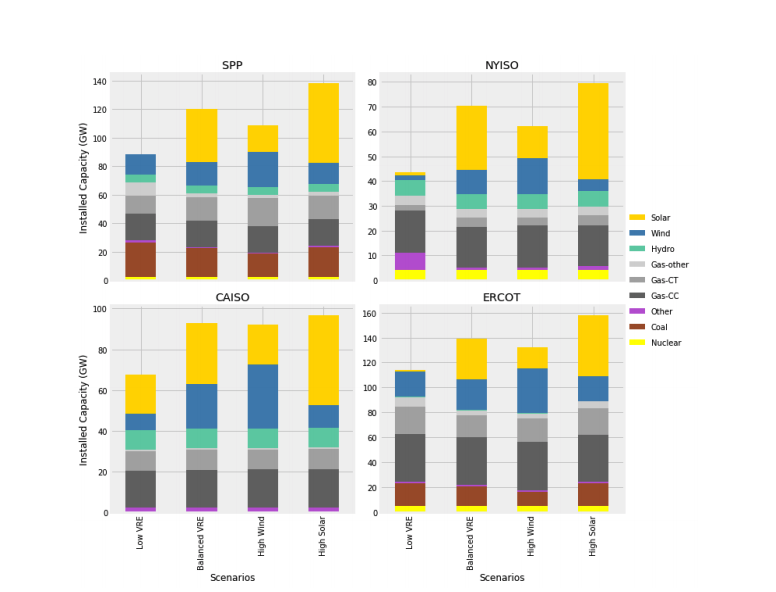 The study compared future renewables scenarios of high solar (30 percent solar, at least 10 percent wind), high wind (30 percent wind, at least 10 percent solar) and a balanced case (20 percent solar, 20 percent wind). When the rate of solar penetration is high, solar supplies a large proportion of a grid’s power in the afternoon. Solar generation can then generally satisfy the afternoon air conditioning load. The grid’s unmet peak demand would then tend to occur in the evening hours when people come home from work and turn on lights and appliances. Both high rates of wind and high rates of solar on the grid were found to produce more price volatility. Thus, in one high wind scenario studied, morning wholesale power prices in the spring as seen by the California System Independent Operator varied from $0 to $50/MWh. By contrast, in a high solar penetration scenario simulated for the Electric Reliability Council of Texas (ERCOT) power grid, which has limited interconnection capacity to neighboring regions, ERCOT would have near-zero power prices more often than any other region studied. In general, in high wind penetration cases when power supplies tend to fluctuate irregularly, the study found benefits accrue from investing in electric water heaters to replace gas-fired water heaters. Electric heaters can more easily be cycled on and off as part of a strategic load management programs. By contrast, in a high solar case when power prices peak at night, energy efficiency investments designed to reduce lighting demand, such as the installation of LED street lighting, would be more cost-effective than those that reduced afternoon loads. Prices for reserve power to make up for short-term power shortfalls were found to be higher when wind and solar provided a higher proportion of the grid’s energy. Higher rates of renewables would lead electricity suppliers to prefer nimbler generation assets that could more quickly ramp up or down in respond to load fluctuations, such as fast response batteries and gas generation. Electric Vehicle Charging Infrastructure in Commercial Locations or at Home? The report also examines the effects of the altered price patterns induced by higher rates of variable renewable generation on decisions regarding electric vehicle charging infrastructure. In a high solar penetration case when plenty of power could be available for afternoon vehicle charging, it would make sense to provide more charging infrastructure in commercial locations, such as shopping centers and office complexes. With an abundance of wind on the grid, however, planners might want to invest in increasing residential charging facilities so more people would charge their vehicles at night.